Margaret Clauder Presents Educational Reading Shows For Libraries, such as Readers are Champions and Lets Read With The Bookworm, performed with puppets, marionettes, music, magic, ventriloquism, costumes, and lots of books. 2 are certified by Young Audiences. "I hope you know how wonderful it is to work with a professional like you. The Summer Reading Club is a big deal and a lot of work for children's librarians - and performers like you ease the burden. You are a rare blend of artsy, creative, and fun; as well as dependable and organized. Wow, what a combination! I'm going to go now and look at your calendar because last year I missed getting a date for your scarecrow character to visit us here. 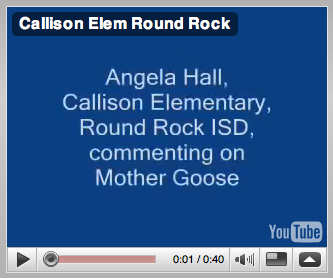 Hear Ms. Hall, the Callison Elementary School librarian, who loved Reading & Rhyming with Mother Goose in March 2009! You need a performer who arrives on time, with a program that engages the audience, isn't over their heads, and ties in with books. 'Ties in with books' is especially important as computers and electronic pads increase in popularity. Margaret delivers on all of these points. Reliability - she always calls several days in advance to confirm. She always sends a printed invoice with the date and time. Every show is recorded at her on-line calendar. You have 3 times the assurance with Margaret - her call, her invoice, and her calendar which you can check at any time. Margaret really understands your need for reliability. Every library show features books and stories. The show is closely tied to the narrative of the book. The reason is to fix firmly in the minds of children that books are exciting, adults read, and that reading is directly related to fun, action, and adventure! Books get top billing in Margaret's shows, because she truly believes that reading is fundamental to all that she does. In addition, Margaret's shows are written at the level of the intended audience. She understands how important it is for the children to receive a message they can understand, and remember. The vocabulary, the concepts, and the presentation are all suitable for the suggested age. 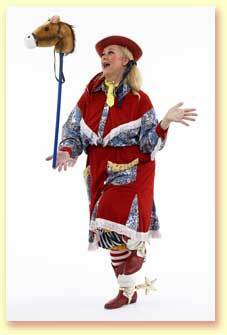 Attendance is good and reviews are excellent because she engages the children with interesting magic, storytelling, puppets, and ventriloquism, or other fun activities. 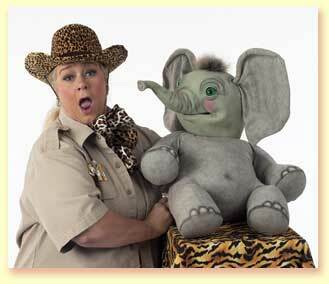 Her show has wonderful surprises, such as a baby elephant who sprays water from his trunk, a talking book puppet, water turning magically into snow, or a goose that honks your nose. 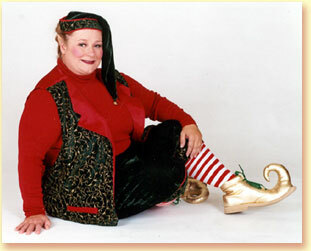 Margaret has 22+ years experience as a professional clown, and adds humor to every character. The humor keeps the audience attentive as they search for the next funny moment. You often see children rolling around, laughing hard at the silliness in Margaret's show. She genuinely loves performing and loves children. Margaret's heart touches her audience. 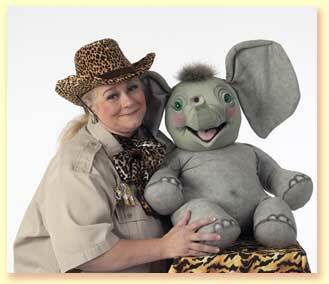 Children fall in love with her characters, building an emotional attachment by the end of the show. Reliability - age appropriate material and presentation - and an emphasis on books. Margaret understands the needs of libraries. Read through the shows listed below, schedule one, and find out for yourself why so many people rave about her programs! Click here to read the 2014-2015 Arts Partners quality survey. The Hero is Within YOU! I Detect A Tale with Imma Sleuth! Sail Into Books with Sailor Maggie! Bullying is a serious subject and children need to know how to deal with it. In this program, children will learn about the 3 types of bullying - physical, relationship, and verbal. They will learn how to deal with bullies using their words and not physical violence. They will also learn how to be sensitive to others so that they are not bullies themselves. This program is based on a curriculum recommended to us by school counselors and educators. We have added our own creativity with the use of puppetry and ventriloquism. Children will meet Michael, the little boy who gets bullied at school and hear his heart wrenching story about how bullying broke his heart. By learning the difference between put-downs and put-ups, children will become sensitive about what they say or repeat. Michael's story will become a story of triumph as children become super heroes and learn how to make good choices in how they cope with bullying. 1. Learn what bullying is and how to distinguish the 3 basic forms. 2. Learn the difference between put-downs and put-ups. 3. 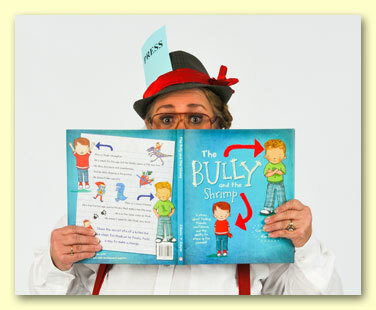 Hear a story about a child that was bullied, and learn a song about bullying. 4. Realize that through good choices, they can make a difference. Why not go ahead and book today? then send a booking form. "Dear Ms. Clauder, We would like to take this opportunity to thank you fr your "Hero is Within You! presentation. We were very excited to feature you as part of our wonderful Wednesdays for summer reading this year. We know that both children and parents alike enjoyed your show and the very important message you shared. Many thanks for your support of this year's summer reading program!" Steam, water, snow and ice. Water is the only natural substance that can take on this many forms - naturally! 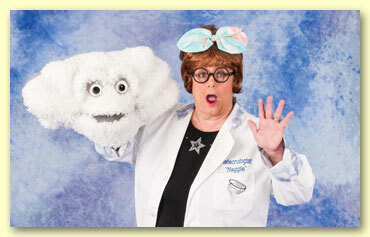 Meteorologist Maggie will perform magic that will demonstrate various weather phenomena. For one example, water will magically evaporate and also turn into snow. What can we make from snow? A snowman of course! A magical snowman will also be made and a picture of a snowman will come to life and talk to us, too! (Based on the story Frosty the Snowman). A water tornado will demonstrate a real tornado. Finally, Chilly the Penguin (a puppet) will help teach kids about the place on Earth with the coldest weather - Antarctica! 1. Water is one of the most abundant materials on Earth. 2. Water naturally forms a solid, a liquid, and a gas. 3. Even the coldest place on Earth has wildlife. 4. The library is a place to learn more about our fascinating planet. "Just wanted to let you know every teacher who attended just loved the show. I myself couldn't stop talking about it. We will definitely be booking again!" Margaret, a.k.a. detective "Imma Sleuth", will take junior gumshoes on an adventure trying to find a story in the library that Margaret is supposed to tell to the kids. Books will be lined up on the table with various titles. Using their powers of deduction, clues, a fingerprint matching book, and a secret code, the junior detectives will figure out which story Imma will finally tell! 3 stories will be utilized in detective school. 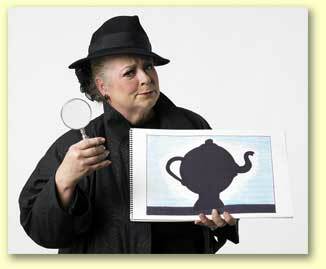 The first, Ruth the Sleuth, will be told at the beginning of the show. 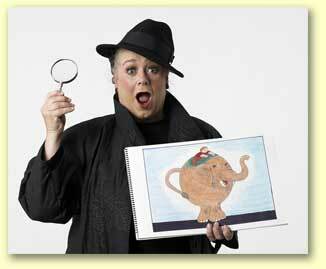 This is a story about a little girl, Ruth, who likes to play detective. She uses her detective skills to solve the case of the missing pizza. This is an original story written by Margaret's son, John, who hopes to publish this story! The 2nd story used in detective training, Why A Disguise, is a comical classic which advises on why children would want to wear disguises. For example, if you are wearing a disguise, your parents won't recognize you and ask you to take out the trash,or wash the dishes, or play with your little sister! An audience volunteer will be dressed up in a funny outfit with a trench coat, glasses, hat, and beard as Imma tells this tale as part of detective school. Finally, clues, a fingerprint matching book, and a secret code are used to eliminate the "suspect books." One-by-one the Jr. detectives will find their list of suspects has dwindled down to just 3 possible choices. By breaking a secret code the name of the culprit book is revealed: Dogzilla by Dave Pilkey. Imma will then tell this story to the children in the final bit of fun. Why not go ahead and book today? Check her calendar; get show pricing; download the study guide; then send a booking form. to show all that they have to share with us! Celebrate Mexico with Señorita Margarita! Great for Cinco de Mayo! 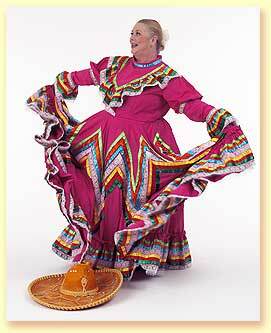 She comes in a traditional Mexican dress and sombrero. 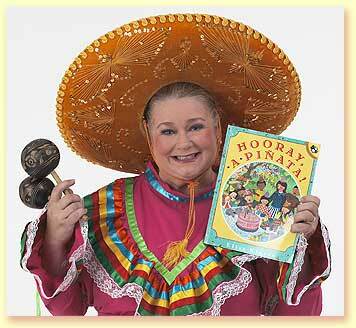 Her show features Rosita the puppet who tries to learn "La Cucaracha" in a hilarious rendition of the song. Also featured in the show is the Mexican Hat dance and Mariachi Loco, a trumpet playing marionette who will bring the house down when his pants fall off! Great for Cinco de Mayo! You may click here for promotional photos for e-mail or print. 1. 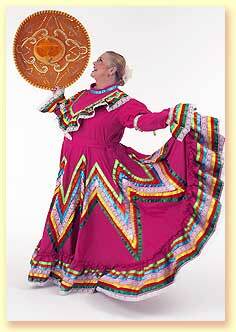 Promote interest, and pride, in Hispanic culture, which plays such an important part in Texas history. 2. Children will hear words and phrases in Spanish and become familiar with their meanings. They will hear a song in Spanish and will be taught the words to the song and the English translation. 3. Increase cultural tolerance by highlighting some of the many Hispanic elements in our society. 4. To encourage children's self-assurance and self-expression by offering a colorful character who is not afraid to be different. Why not go ahead and book today? Check her calendar; get show pricing; then send a booking form. 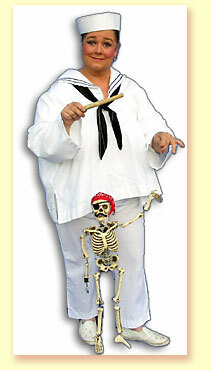 Sailor Maggie stringing along a bony pirate friend, and one of the stars of her show! The pirate marionette is just one of the many puppets featured in this show. Are you ready to THRILL your audience with a show that is fun AND different? Are you ready for the books to FLY off your shelves? If so, book Sailor Maggie and set sail into the rich world of books! Margaret’s Sail Into Books is a show FILLED with LOTS and LOTS of puppet characters that come to life right before your eyes! Sail Into Books features the story, Way Down Deep in the Deep Blue Sea, an enchanting story told by Maggie with Elmer the puppet and ventriloquism galore! Elmer goes on a deep sea adventure children will always remember! He encounters everything from sharks to submarines, pirates to porpoises, and finally emerges from his adventure in time for Mom to “dry him off” from the adventure in the tub! Children can sing along to old favorites like Octopus's Garden and Itsy Bitsy Teeny Weeny Yellow Polka Dot Bikini. This is sure to be popular with audiences 3 and up! 1. Imagination is the key ingredient for a great adventure! 2. Books provide the fuel that your imagination needs to run. She devours books, and grows to be a really big bookworm by reading! 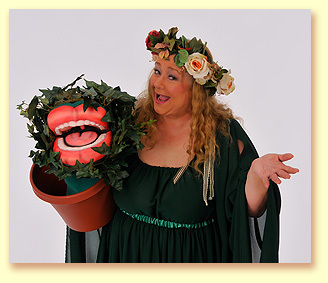 She brings stories to life for the audience with puppets, magic, or unusual props. Bookworm stories include: Sylvester and the Magic Pebble by William Steig (a Caldecott award winner), Kat Kong by Dave Pilkey, and Mean Soup by Betsy Everett, a creative way for children to manage anger. All these stories are available in most children's libraries. The Bookworm has a cute book puppet who teaches children to take care of their books, and a magic card trick that shows the most valuable card to have is not an Ace, but a library card! 1. Children meet a talking book puppet, Webster the Dictionary, who helps children learn the proper care of books. 3. Children learn that all books have magic. To let the magic out, all you have to do is READ them! 4. Children will learn that books are free on loan from their public library (as well as their own school). 5. Children will learn about the Summer Reading Club. They are encouraged to join their local program. Click here for THE Bookworm press release you can use to announce the show! "As I was looking at your website and saw that you are the Book Worm. I saw your performance when I was teaching at Kennedy Learning Center in Dallas. My students and I absolutely loved your show. It was a fantastic performance[!]" "We had the best time watching your Bookworm show yesterday. Everyone has been praising your show! We can’t wait to see you next year." Janelle Sanders, former librarian for Roberts Elementary in the Dallas ISD, talks about THE Bookworm! Julie Moore of the Arlington ISD, talks about THE Bookworm at Razzle Dazzle reading day with 1,000 in attendance!. 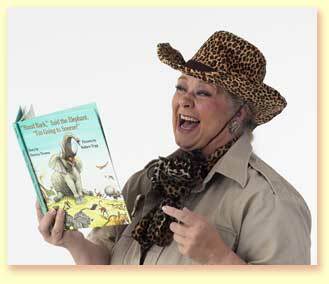 As a Safari clad storyteller, Margaret performs the popular children's book, Stand Back Said the Elephant I'm Going to Sneeze. Using her brilliant puppetry and ventriloquism skills, this book will come to life as various animal puppets tell the rhyming tale. Margaret wraps up the show with crazy animal magic when Chester the baby Raccoon magically appears, disappears, and reappears in the craziest place imaginable! Ages 2-10. 1. Excite children about the story by bringing actual text to life with several puppets. 2. Illustrate with the performance that stories in books are engaging. 3. Encourage children to explore other books in the library. 4. Teach the children many interesting facts about a variety of animals from all around the world, including elephants, penguins, kangaroos, and more. Thank you for being a part of Kids Fair Safari 2008! We had a great time and enjoyed your performances. Masai Maggie loves to read, and here, she is holding and laughing at one of her favorite books! Get closer if you want to read the title on the cover! (Click photo for larger picture.) Sneezy and Masai Maggie are always friends. Yes, Sneezy can be playful, but at heart, he's a sweet elephant. Goosey is talking quite energetically, while Lamby adds a comment or two. Mother Goose gives her full attention - just like the kids in the audience. 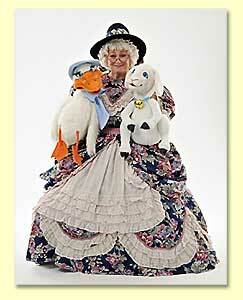 (Click photo for larger image) Mother Goose has Lamby and Goosey perched on her lap, holding still for this group photo. Celebrities, one and all! 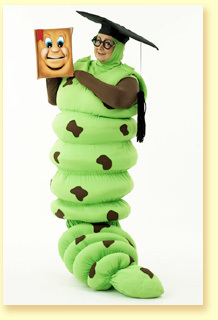 This popular character encourages children to read books and enjoy poetry with classic rhymes. She regularly visits schools and libraries all over the Dallas Ft. Worth metroplex. 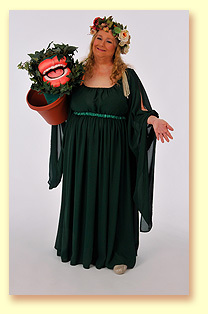 She teaches the poetry to the children and has them act out the various rhymes utilizing props. 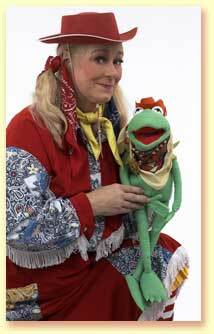 She has a hilarious show with lots of puppets and ventriloquism. Kids love Lamby, Mary, Goosey, Itsy Bitsy, and the other puppets Mother Goose utilizes as she shares the verbal music of language expressed in rhyming. Age pre-K to grade 3. 1. Engage children in rhyming and rhyming games to deepen interest in language. 2. Instruct children in creating their own rhymes, and encourage this creativity. 3. With rhyming, develop sensitivity to word patterns. 4. Excite children to seek books of Mother Goose or other rhymes, and read them. 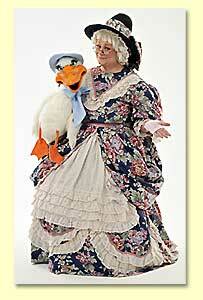 Mother Goose with one hand extended, introducing Goosey to the giggling, whispering audience. 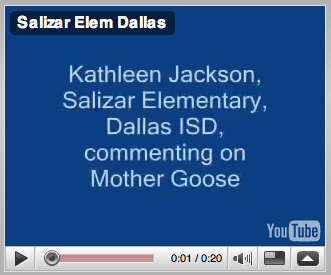 Kathleen Jackson, librarian for Salizar Elementary School in Dallas, ISD tells the world about Mother Goose! 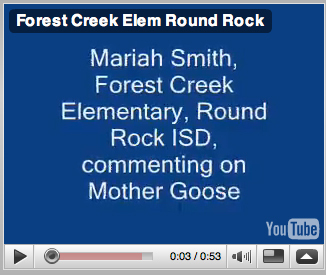 Let Mariah Smith, librarian at Forest Creek Elementary school, Roundrock ISD offer a view on Mother Goose! What happens when Hound-Dog The Kid takes books from the library without using a library card? That's when Sheriff Kermit, Get-a-long the Dog, and Giddy-up the Pony go on a western adventure to catch the bookish bad guy and bring him to justice! The audience will learn - along with Hound-Dog - that there is a better way to get books, music, and videos from the library. All you need is your parents to get you a library card, and the library is happy to loan these materials! This ties in with western week, features a LOT of books, and promotes library cards with fun, loveable puppets! 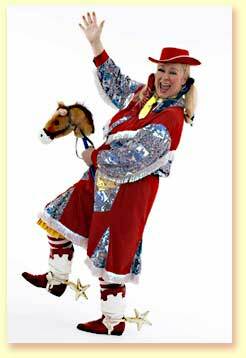 Margaret features ventriloquism, magic, as well as a beautiful western costume for Bucky! 1. Kids will learn that the library is a valuable resource for all kinds of materials they will enjoy. 2. A library card is the key to getting books free on loan! 3. Children will experience puppetry and ventriloquism and see a tall-tale come to life before their eyes. 4. Children will be encouraged to use their imagination to write their own tall-tales and take western adventures on their own. Click here for a Bucky the Cowgirl press release you can use to announce the show! Sometimes Gitalong acts badly; he has kicked Bucky and left a big pair of hoof prints on her dress! September/October/November. This is a non-scary "clown" scarecrow. She performs fall magic and songs about harvest time. Children will learn and participate in "The seed cycle". They will love "Jimmy the Crow" as he steals the corn. Tie this in with harvest time at your school. Age 2 - up. 1. Teach children about the growing cycle from seed to harvested food. 2. Help children become aware of how essential corn is to a variety of products they encounter every day. 3. Teach children a fun rhyming song they can sing for their own entertainment, strengthening self-directed amusement tendencies. 4. Remind children of the importance of farms and farming to our daily lives. 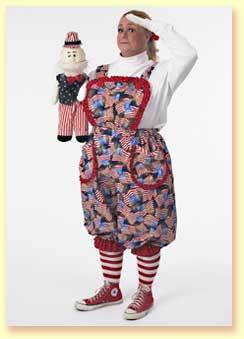 A wonderful educational patriotic show featuring puppets Uncle Sam, Keisha, and Elmer. This show will educate the children on the meaning of many symbols of America including the flag, the Statue of Liberty, and the American eagle. What does it mean when the Texas flag has the white stripe flying on top? Most adults don't even know this! Tie this show in with history books on our country. Feature our nation's history! Available June 1-July 5. 1. 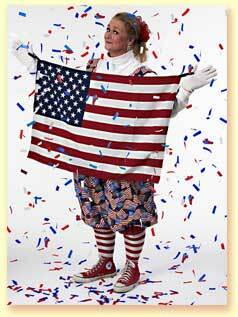 Children will learn the significance of the colors red, white, and blue in our nation’s flag. They will also learn the significance of the stars and stripes in an entertaining way, as well about who Betsy Ross was and her significance to our country. 2. Children will learn and participate in singing several patriotic and historical songs. 3. Children will learn about several patriotic symbols of American culture such as The Statue of Liberty and Uncle Sam, and the origins of these symbols. 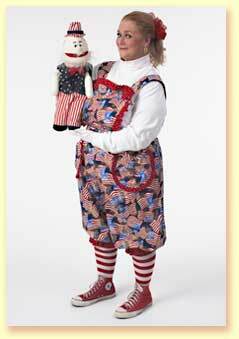 Patriotic Patty with her American friend Uncle Sam, one of the funny characters from Hurray for the USA! (Click photo for a larger picture.) Patriotic Patty shows Sam how to salute. Children will enjoy this Fourth of July program about U.S. history! Margaret was one of the first to develop an open face bunny character. Bernice is approachable and interesting to watch. 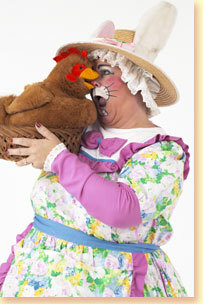 Bernice is a cute open face bunny who teaches children interactively to be good helpers by telling the story of "The Little Red Hen" with puppetry and ventriloquism. The show features fun Easter magic which is still relevant to the theme of books and reading. 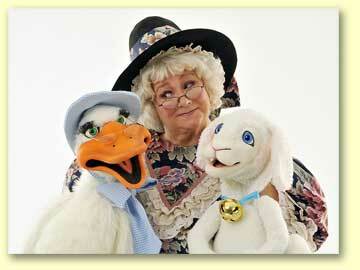 Bernice concludes her show by producing a live bunny that the children will be allowed to pet. 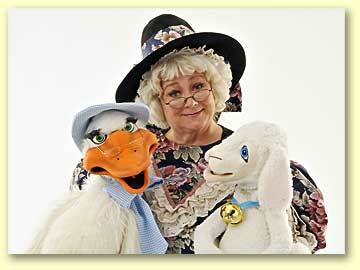 You will find that Bernice Bunny is a character - and has a show - which matches well with the Easter season. At MCP, we feel that reading and books are right for any season, all through the year. This show is for age 3-up. 1. Language arts will be reinforced through interactive storytelling. 2. 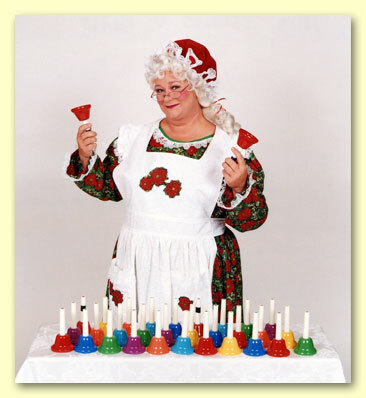 Children will be encouraged to use their imagination when Bernice concocts a strange “Carrot Stew” for them. 3. Children will observe positive reinforcement of values through the interactive story The Little Red Hen. pop-culture, not so harmless plant! First the audience meets Mother Nature. 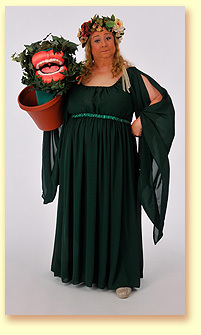 Next, they are introduced to a most unusual plant puppet, not indigenous to Texas. This is Audrey, the Venus fly trap. The audience learns that Audrey is native to the Eastern U.S., growing in swampy wetlands. The soil is poor in that region, and Audrey is not very good at photosynthesis. So how does she grow so large and healthy? She eats flies, of course. After meeting Audrey, the students are intoduced to Mama Racoon. There are many qualities which make her distinctive, yet the one Mother Nature emphasizes is her nocturnal ways. When the Mama Racoon puppet goes back to bed, Mother Nature shares 2 stories. The first is A Tree For Me, and the second is Calvin the Caterpillar, a tale about a caterpillar changing to a butterfly. While telling the story of Calvin, Mother Nature has teachers and students on stage helping. This program teaches about the natural world, which makes it ideal to welcome spring, celebrate Earth day, or emphasize ecology. Along the way, students learn about unusual life forms and big words for their vocabulary. 1. Kids learn the definition of the word nocturnal, vegetarian, and photosynthesis. 2. Students hear 2 stories told by Mother Nature. They are encouraged to find more stories in the library. 3. Children learn a vegetarian eats only plants. 4. Kids discover a Venus fly trap is a meat eating plant, which means it is a non-vegetarian. You may click here for promotional photos. giant Venus fly trap in your arms? 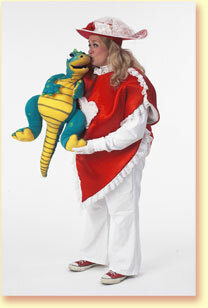 January/February - Dressed in a large heart costume, Lovey will entertain children with her puppets singing silly love songs. 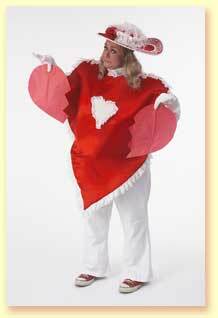 Children will delight in pretending to be "Cupid" as they magically shoot Lovey's heart with their invisible arrows! Watch the amazing valentine card magic trick too! Ages 3-up. 1. With a tangible metaphor, show that love is inexhaustible. 2. Kindness to others makes a difference. 3. Reinforce positive, loving behavior in the audience. Lovey Dovey brings a lot of 'heart' to her work. This is another Margaret Clauder costume that reinforces the theme of the show, and delights the audience! (Click photo for larger image) How do you repair a broken heart? During the show, Lovey Dovey performs a little magic with a torn and restored paper heart. Alphie's show reminds the audience of the values associated with Christmas without turning preachy. After Thanksgiving. This show combines holiday magic, toys coming to life, and a picture of Santa Claus magically speaking to the children. The wonder of Christmas will shine through in this beloved program. The show features a magical Christmas stocking which produces funny things. 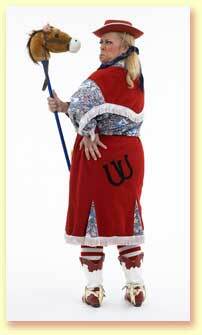 The audience will meet Elmer, the boy who is "gettin' nuttin'" for Christmas. One of the highlights is when the audience meets the little doll - who comes to life as part of the magic of the holidays! All ages. 1. The essential message of Christmas is about intangible gifts, such as love and generosity. 2. We are loved for who we are rather than the presents we give at Christmas. 3. Remember to relax and enjoy the holiday season, resisting the stresses of the season. Christmas storytelling, puppetry, and magic. The show changes from year to year with new stories and new magic! It is always a highlight of any school, church, or company party though. Her stories include: How Santa Got his Elves, The Boy with Too Many Toys, Olive The Other Reindeer, The Polar Express. This video made by A.W. Brown Fellowship Leadership Academy in Dallas, TX. It is shared with permission. November only. The story of Thanksgiving from the Indian's point of view. 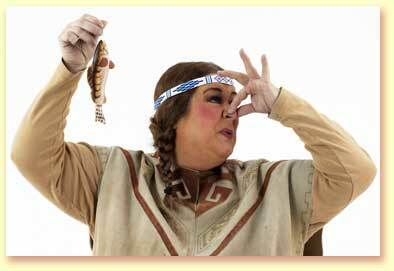 This show uses authentic costuming and Indian artifacts that the children can actually touch and see. Music, magic, and storytelling are used. A good show for schoolers! Age 3-up. 1. 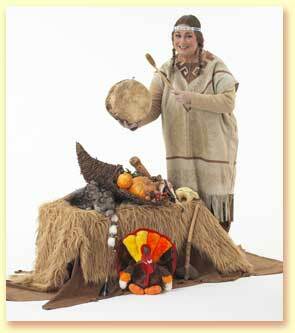 Introduce children to Native American culture, and offer an alternative perspective on Thanksgiving. 2. 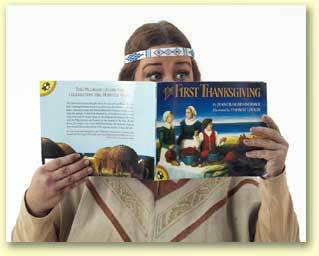 To teach children about Squanto, a Native American with a significant role in U.S. history. 3. To increase cultural sensitivity by helping children become more familiar with people who, at first, seem entirely different. 4. Share with the audience simple bird calls they can practice after the show. Singing Bird instructs children in Native American farming, which planted squash and corn seeds with a small fish which served as fertilizer. Of course, she adds an entertaining spin which the audience really enjoys! (Click photo for larger view.) 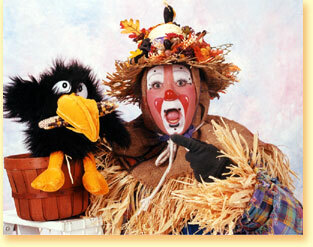 Singing Bird uses many American Indian themed props in her show. The audience has a clear sense of cultural difference right from the start of the program! 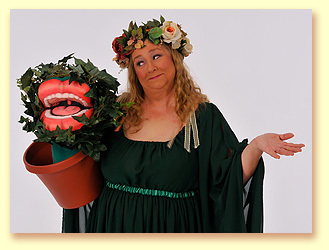 Miss Margaret the Story Lady: Children learn about God's message that all children are special to God as they hear the telling of this old Testament tale with puppets and ventriloquism. Children will also learn several easy Christian songs with actions. Copies of words are available. Especially for Christian based schools. Age 3-6. Margaret the Story Lady is an ally for Christian schools. Let her help your message with her program. After your MCP show, please take 5 minutes to share your experience with a couple of friends by text or e-mail. They will be glad to know, and you'll be one of their hip friends who always knows the coolest stuff. Thanks! MCP, bringing educational and entertaining programs to libraries all over Texas and the DFW metroplex, in places like Allen, Arlington, Dallas, Richardson, Plano, Frisco, and Fort Worth. For children old enough to recognize and use the library, let MCP perform a show that engages kids and encourages reading. You'll find programs at MCP which answer the question "what can you learn from the library?"